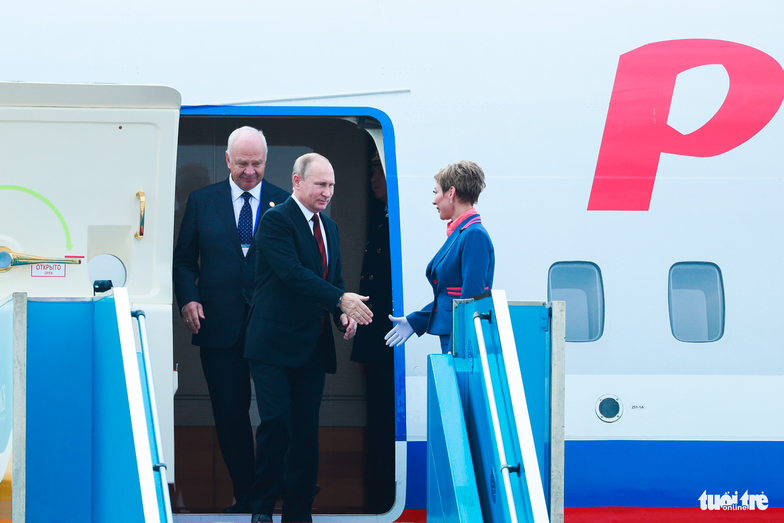 Russian President Vladimir Putin’s flagship aircraft touched down in Vietnam’s Da Nang at 9:00 am on Friday as the leader prepares to join the upcoming APEC summit in the central resort city. Putin was greeted at the airport by a delegation headed by Da Nang Party chief Truong Quang Nghia and Vietnamese Minister of Education and Training Phung Xuan Nha. The president’s private jet is a Russian-made IL-96-300PU, which is a wide-bodied, long-haul airliner distinguishable from the passenger model by its extended fuselage fairing. The Russian government installed an advanced communication system on board that allows the aircraft to act as a management center capable of carrying out the prompt commandment of troops in case of unexpected conflict, according to Business Insider. A fleet of automobiles with increased security and safety features that the Russian head of state would be using during his time in Vietnam had been transported to Da Nang on Monday. Kremlin aide Yuri Ushakov on Thursday confirmed to the press that President Putin would join bilateral meetings with Vietnamese State President Tran Dai Quang, Philippine President Rodrigo Duterte, Chinese President Xi Jinping, and Japanese Prime Minister Shinzo Abe. Ushakov added Friday that President Putin would also partake in a much anticipated meeting with U.S. President Donald Trump in Da Nang, where the leaders would discuss anti-terrorism efforts, Syria and North Korea. Trump is scheduled to land in Da Nang on Friday afternoon. According to Ushakov, the upcoming meeting between Putin and his Chinese counterpart was expected to offer some interesting insights, as Vietnam would be Xi’s first stop after hosting President Trump in Beijing during the latter’s three-day China state visit that concluded on Friday. The Russian president had on Tuesday decided to provide Vietnam with monetary support of US$5 million and 40 metric tons of goods to help the country rebuild from the aftermath of Typhoon Damrey, which hit the central Vietnamese coast last week, killing at least 106.